The truism that the outside observer of China sees a clear picture often proves wrong. Journalists and pundits outside China may notice the appearance of new McDonald’s restaurants or Starbucks franchises on the urban landscape, but they are often blithely oblivious to the hopes and fears of real Chinese people. A fuller understanding of China must take into account local agitations, the circumstances of lived experience, and critical expressions. In editing One China, Many Paths, Chaohua Wang has sought to measure the heartbeat of contemporary China’s sensitive and critical minds. This collection offers an ensemble of interviews and essays coming out of the thinking minds of the Chinese intelligentsia. Yes, the writers here still unabashedly see themselves as belonging to the intelligentsia and take it upon themselves to tackle the pressing issues of the day. One might call this book a handbook of major intellectual pronouncements about China in the past two decades. Originally written in Chinese, the essays were translated by experienced and informed hands, and academic discourse flows into pleasurable reading. Anyone who wants to understand the real issues and problems confronted by Chinese as shapers of their own fate will have with this volume a reliable guide. 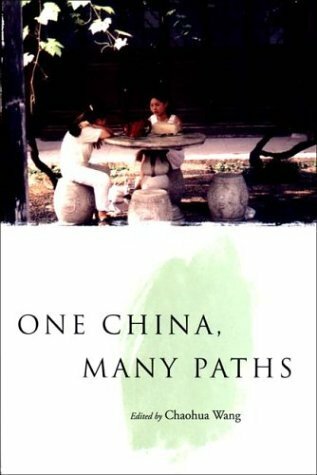 Scholars of China would do well to turn to this book for an appreciation of socio-historical contexts and discursive undercurrents when writing about Chinese fiction, film, or mass culture. Wang’s lucid “Introduction” recounts a multilayered story of intellectual ferment and maturation. In a mini-history of intellectuals’ educational background and later stages of intellectual growth, she walks us through the mutating issues and debates from the 1980s to the 1990s. The distinction between the New Era reform of the 1980s and the economic boom of the 1990s is familiar enough, but the “Introduction” offers a clear trajectory of what has been at stake from one decade to the other. The 1980s was imbued with a forward and outward looking zeitgeist, filled with innocence and dreams. But the watershed events of Tian’anmen in 1989 and Deng Xiaoping’s tour in southern China in 1992 ushered in a decade troubled by complexity and heterogeneity, competing visions, and perplexed reflections. Economic dynamism, political stagnation, and deepening social divisions made this period “interesting times” that tried humans’ souls. As people groped for a future, space for discussion widened. Debates have transformed from those centering around the humanities to pragmatic issues of social and economic restructuring; academic discourse has taken on more political and policy overtones.Chaohua Wang actively participated in the Tian’anmen protest in 1989 and shares intellectual kinship with the writers and interviewees represented in this volume.Although it traces the footprints of her fellow travelers, the “Introduction” itself is a unique voice in the intellectual scene it describes. The controversial struggle between liberalism and the New Left runs as a thread through the collection. In Wang Hui’s analysis, the question “Whither China?” defines the changing alignments of liberals and the New Left. The two contending positions emerged on the intellectual scene in response to international events: the Asian financial crisis shook faith in capitalism, and the NATO bombing of the Chinese Embassy in Belgrade prompted intellectuals to have second thoughts about American values and democracy and put liberals on the defensive. Although it is important to come to terms with the changing re-alignments and splits in the seemingly polarized camps, applying political labels can be misleading. This is not only because the two sides have so much in common, but also because one side can change places with the other or may make alliances before any position hardens. Still, it is useful to identify what intellectuals disagree about. Generally, the liberals constitute a “right-wing”; they are often economists who idolize privatization and marketization without reservations or consideration of social welfare. More moderate liberals temper this market fundamentalism by critiquing and exposing the power monopoly and corruption that plague the “free” market economy. The New Left also has contradictory strains, but generally focuses its critique on the collaboration between the market and the state. Wang Hui suggests that a healthy market depends on healthy and productive state control. The market is not new to China, and the history of world capitalism has shown that the market was not opened by the allure of commodities or needs, but by gunboats and wars. It is not an act of God or nature, but a process of accumulating wealth and power. So New Left intellectuals like Wang Hui would like to see a good state organization of the market, with a public policy for the common good and protectionist measures to shore up the national economy (p. 64). Here is a small confession. In reading this volume and seeing how ideological lines shift so quickly in this controversy, I had a change of mind. I have tended in my own scholarship to focus on the consequences of frenzied economic development and to express suspicion toward the gospel of the neoliberal market.However, the complex array of views expressed in this book push me somewhat toward the liberal side of the spectrum, because the liberal view is not necessarily the natural ally of the market and often utters the strongest call for social justice, equality, and moral responsibility in economic development. Very often one cannot tell a liberal from a left-leaning writer.One China, Many Paths show us that the controversy between the liberals and the New Left presents “a range that contains many intermediate and overlapping shades of opinion” (p. 40), reflecting the crossroads and uncertainties of the 1990s. The main current of intellectual discourse of the 1980s diverged into smaller streams in the 1990s. Renewed attention was paid to scholarship and empirical studies of history and the tradition of learning. In launching Xueren (The scholar), a signal journal of research in the humanities, intellectuals sought to preserve the integrity of knowledge in the face of excessive political intervention. Chen Pingyuan suggests that intellectuals can only do so much in politics, but can play a significant role in developing professionalism and historical scholarship. This professionalism, which came on the scene as a reaction to the polemical, large-scale theoretical syntheses of the 1980s, promoted the solitary pursuit of research. Professionalism premised on a deep, intricate sense of history, however, may not be so apolitical as it seems. Wang Hui, Cui Zhiyuan, and Qian Liqun look to the history of national independence and socialist practice in an attempt to retrieve useful themes and forgotten motifs. By way of historical reflection they speak about politics and reform in an enlightened, historically sensitive way. Wang Hui discusses the need of late-developing countries to invent their own anti-modern modernity. This throwback to history can be traced in Wang Xiaoming and Wang Anyi’s essays and in the debate on the humanist spirit. Out of the cultural atmosphere in which market values were increasingly unbridled, resistance emerges. In the same vein, Qian Liqun looks at amnesia and the decline of historical memory as a product of commercialism. He rejects the simplistic interpretations of historical figures, such as Sun Yat-sen, Lu Xun, and Mao Zedong, in recent erasures of revolutionary and nationalist traditions, and retrieves the usable memory of self-critique and self-empowerment. Illusions of economic prosperity and consumer lifestyle screen out a sense of history; in response, empirical research and the new use of history can restore the spirit of human culture and enlightenment. One remarkable characteristic of the writers represented in this book is their use of sociological, political, and economic analyses. This underscores the methodological soundness of approaching China as an unstable whole, pulled by many diverse strains and in many directions. This approach is as important for social scientists as for humanists. Prominent social scientists and historians, such as Qin Hui, He Qinglian, Hu Angang, Gan Yang, explore issues closely related to immediate questions of political structure, assets transfer, privatization, constitutional visions of mass participation in the political process, the disturbing polarization of social classes, the widening divide between the city and the countryside, the stock market, and the experience of Eastern European countries and Russia since 1990. Li Changping’s essay about the crises in the Chinese countryside is particularly poignant and may draw attention away from the fetishistic fixation on urban glamour and toward the yellow earth and the peasantry. In Qin Hui’s analysis, the peasant question is essentially a problem of China’s modernization. With all these pragmatic and policy-relevant essays, the book returns to a discussion of the primal scene underlying the intellectual ferment of the 1990s: the events on Tiananmen Square in the spring of 1989. In a dialogue moderated by Professor Leo Ou-fan Lee, Wang Dan, Li Qinqi, and Chaohua Wang, all student leaders in the June Fourth movement, discuss the meaning of the event. The movement is interpreted as a political awakening or as a harbinger of the headlong pursuits of personal freedom and material consumption. The different interpretations hark back to the liberal versus New Left controversy and offer parameters for envisioning China’s future. The editor lists a number of important issues omitted by this book, including literary criticism, legal reform, and national minorities. Another significant absence is discussion of international relations in the light of China’s ever-tighter integration into the global economy, though there are of course scattered comments in interviews about how geopolitical tension and economic rivalry bear on intellectuals’ understanding of China’s place in the world. But this understanding remains intuitive and undeveloped. Where China is going is part of the question of where the world is going. China impacts on the world and the world affects China ever more powerfully and directly. With its rapid economic growth, widening ties, and larger role in the WTO, many worry about the “rise of China.” Will it be “peaceful,” as the PRC state leaders insist, or violent? Global free trade might appear to the New Left as a sign of U.S. economic expansion, but globalization is not making China a loser in relation to the rich and powerful of the world, although it negatively affects both Chinese peasants and American workers. Rather, China is encroaching on the U.S. market like “Wal-Mart with an army” and is bankrolling America’s profligate spending habits. China is on its way to becoming the one country in the world that is likely to contest American power. This situation greatly challenges the conventional understanding of the nature of China’s political structure, policy agenda, reforms, and intellectual orientations. The rise of China is a remarkable fact that has been debated hotly by U.S. observers, but in China it has yet to be scrutinized through reasoned discourse and intellectual debate. A sequel to this valuable collection might fill the gap.